Monica Garry of Fibre Tibet shares her journey to sourcing sustainable cashmere and wool. Fibre Tibet is a luxe handwoven collection featuring the finest cashmere and wool from the Himalayan region. Our designs are woven in Kathmandu and integrate traditional techniques, including handspun yarns, into our designs. The collection is part of Noble Fibre, Inc., a social benefit corporation that invests in nomad communities and artisan enterprises, including a woman-owned business in Tibet. The first handspun, hand-woven cashmere textile I ever encountered was many years ago in Kathmandu, Nepal when I was a student. My Nepalese teacher wore a beautiful shawl made of natural brown cashmere with twisted crème and brown fringe tassels. I found out who made the exquisite piece and purchased one each for my mother and me. Today the shawls remain in perfect condition—a testament to handmade artisan craft and high-quality cashmere. This began my quest to find the finest cashmere and wool in the world—and that quest led me to Tibet, and to the high mountain regions along the Tibet-Nepal border. For over 18 years, I traveled to all corners of the country with Tibetan nomads, artisans, and businessmen and women. On horseback, foot, buses, and 4-WD Jeeps, I stayed in the nomad’s yak-wool tents and learned about their traditions and their way of life. I visited small workshops where mentor-apprentice relationships continue. And I learned what sustainable business means for Tibetans who are concerned about their culture. These were cherished times for me. I founded and ran a non-profit fund to support social enterprise, environment, health, education, and cultural sustainability programs. 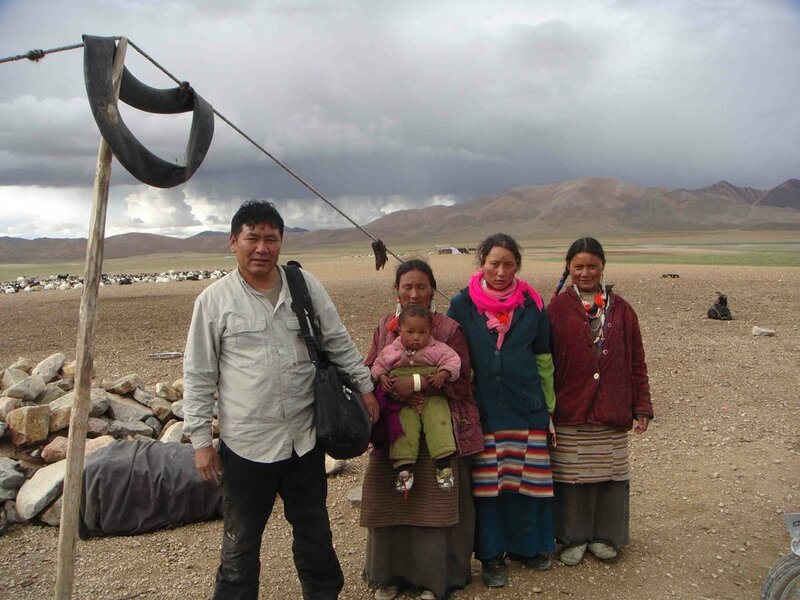 We brought together local partners, government and international institutions, and donors to support locally driven and designed initiatives, and focused on Tibetan nomads since they comprise 40% of the population. The nomads' wealth is in their herds of goats, sheep, yaks, and horses, so one of the most effective ways to increase their incomes is to add value to their wool and cashmere. And the most expeditious ways to do this was to help them secure fair market prices and start their own businesses. Last year Noble Fibre provided start-up funding for a Tibetan woman to establish her own company in Lhasa and Beijing to source and sell cashmere. Over the years I gained a great deal of knowledge about cashmere and wool directly from goats, nomads, traders, weavers, cooperatives, artisans, designers, scientists, and environmentalists, as well as masters, spinners, technicians and designers in Biella and Milan. Social and artisan enterprise has the potential for providing nomadic and artisan communities with a more equitable and sustainable way to increase their income and sustain traditions. In 2000, I launched a new initiative, Noble Fibre International (NFI), with the first collection—Fibre Tibet—of Tibetan cashmere and Tibetan yak wool. NFI worked in close partnership with Tibetans and an Italian company to produce the first Fibre Tibet collection. Fibre Tibet’s yak wool and cashmere apparel, home, and accessories products were sold at Barneys NY and fine boutiques in the US, Asia, and Europe. This helped generate awareness of the high quality of both Tibetan yak wool and cashmere. Now many brands are using yak wool and there is an increased demand to source cashmere from Tibet. Sales from the Fibre Tibet collection circled back to the nomads in Tibet and provided funds for their cooperatives and non-profit projects. In 2012, Noble Fibre registered as a Social Benefit Corporation (SBC) and this is where I continue my work with nomads, local businesses on the Tibetan plateau and in the Nepal and Indian Himalayan regions, and a great team of advisors and supporters. NFI continues to produce Fibre Tibet collections, and we have just started working with cashmere from Ladakh, India (Changtangi-pashmina goats), which is woven in Rajasthan. NFI is also working on collections of rare, one-of-a-kind textile pieces. The goal of Noble Fibre is to source fibre and other materials directly; improve fibre quality; increase incomes for nomads, weavers, local businesses, and workshops; and produce exceptional quality products for our customers at a great value. Noble Fibre sources some of the cashmere directly from Tibetan nomads in Western Tibet, near Mount Kailash, for the Fibre Tibet collection. Currently quantities are limited and distances to access the regions where we work is an 8-10 day drive from Lhasa. Our cashmere is brought from Western Tibet to Kathmandu, Nepal, to one of Noble Fibre’s workshops. Kathmandu remains one of the finest centers for hand weaving. Traditions are alive and incorporate techniques from various parts of the Himalaya and Southeast Asia. The workshops also produce modern, machine-knit pieces. In order to help improve fibre quality and increase nomad incomes we provide tools and training for combing, clipping, and sorting. Our goal is to help nomads increase their resources and sustain traditions. Noble Fibre strives to achieve not just financial returns but social, cultural, and environmental returns. Our goal is to continue to support local businesses, including start-ups and growth, where we work so they can thrive and provide employment and economic opportunities. We work very closely with our partners so we can check and advise on labor issues and integrate best practices for sustainability. One of our partners is certified fair trade and others are on their way to gaining certification. We know all of the weavers, workers, managers, and nomads! Cashmere is a fine goat fibre (hair). High-quality cashmere fibre is rare in terms of its softness and strength. There are 11 recognized breeds of cashmere goats, most of which are found in China, the Tibetan plateau, and Mongolia. There are also smaller populations in Northern India, Nepal, and parts of Central Asia. The best cashmere is sourced from high altitude environments where goats range free. Market demand for cashmere continues to increase; however, basic knowledge about cashmere, including its source, geography, quality, and sustainability is lacking. Cashmere is not from Italy or Scotland. Cashmere that is labeled as Italian or Scottish is misleading; the raw material is from Asia and it is only spun into yarn in Italy or Scotland. Most raw fibre, including cashmere, is sourced through brokers and sold to buyers and factories at major markets in Biella, Italy, and Guangzhou, China. Quality is graded and priced according to current market prices. Most workshops and designers have no way to trace or verify the origin of their cashmere and wool, relying on the word of their broker or seller that they are buying cashmere from Mongolia or Tibet. Quality of cashmere varies and it is increasingly difficult to find high-quality fibre. Micron count and fibre length are key for measuring the quality of cashmere. The micron count is the density of the fibre. A fibre with a lower micron count is thin and softer. A fibre with a higher micron count will be thicker and more coarse. Micron count for good quality cashmere is 14 to 16 although it often can be lower and hence finer. A fine merino wool has a micron count of about 18-20 and yak wool’s average micron count ranges from 16-22. Alpaca has a micron count of around 20 microns or higher. Fibre length for cashmere ranges from 22-42 mm. The longest fibre makes the best yarn as it twists better and does not break. For Noble Fibre’s collection, including Fibre Tibet, we only use 36 mm length fibre or above with a micron count of 14-15. If the fibre is fine and long it can be made into an ultra-soft yet strong yarn that will endure. Shorter hairs do not twist as well when made into yarn and will break, resulting in lower quality products that may only last a year or two. A kilogram of good quality cashmere can range in price from $75-$140 depending on the fibre length, micron count, origin, and color. 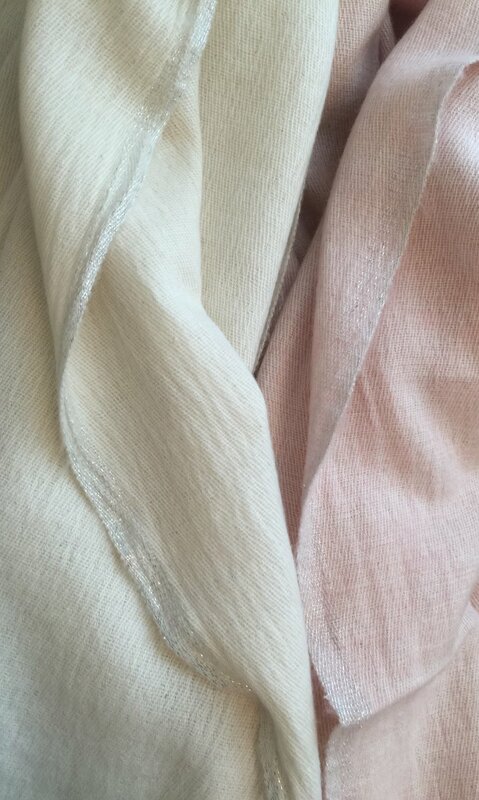 White cashmere is more expensive as it can be more easily dyed. When yarn is carded and spun into yarn, approximately 10% of the material is lost through processing. It can take up to 3 kilograms to make a throw blanket depending on the ply (thickness) so the material cost of high-quality cashmere is a significant cost of production. However, for the customer it is a good investment to buy high-quality as their shawl or blanket can last for decades. The first blankets we produced over 12 years ago are still in use! However, not all brands, including well-known ones, use high quality cashmere even if they have high price points. For Fibre Tibet collections, we source cashmere and yak wool directly from nomads in Tibet or through trusted partners who source directly in Nepal and Ladakh. We also buy spun yarn from Mongolia through locally run artisan businesses for items that require certain yarn gauges. Providing training and tools to nomads to improve collection of cashmere so fibres are as long as possible and do not break. 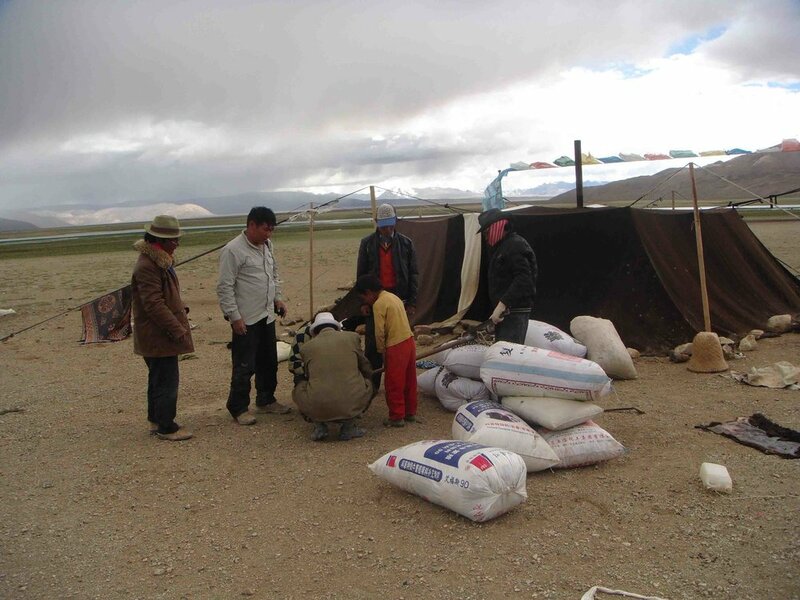 Nomads receive a higher price for their cashmere and wool. These small batches could be certified as organic as the goats range freely and do not receive any antibiotics or supplements that have become common in some goat-raising programs. It is important to note that other fibres or lower grade cashmere are often mixed into high-quality cashmere at spinning factories; unless you have control of your supply chain, you do not know what kind of cashmere you really have. Noble Fibre ensures this does not happen. Cashmere and yak wool are now more widely available in the market, and consumers too are more concerned about the source and origin. The bad news is that the increased demand for cashmere is creating environmental and economic problems for many nomadic regions. 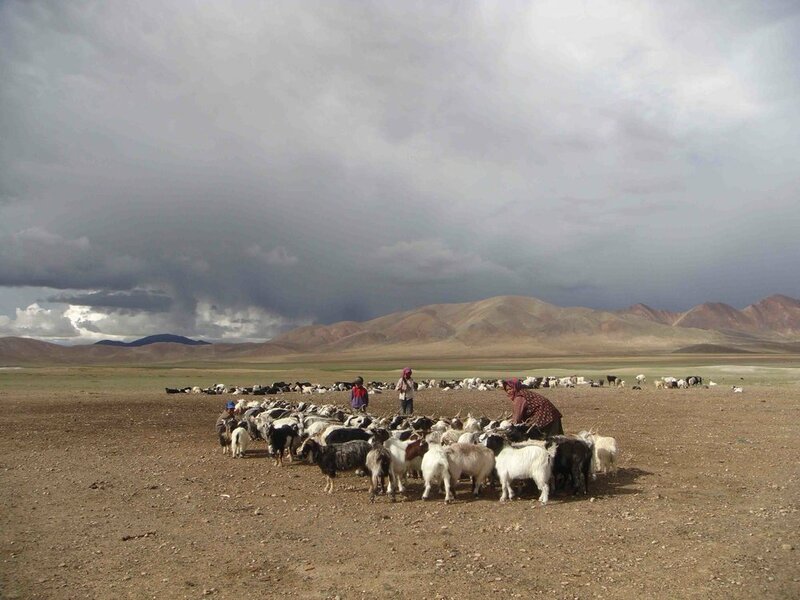 Over 65% of Mongolia’s grassland has degraded due to the increase in goat herds to meet the market demand for cashmere, according to a recent BBC report. Desertification, (where grassland turns into sandy desert) is occurring due to overgrazing and climate change, and it severely impacts the land, livelihoods, and culture of nomads and wildlife. The industry overall needs to look at the environmental impact and be more responsible in sourcing cashmere. There are no real ethical supply chains in the cashmere and wool fibre world until the land that supports the goats, yaks, and sheep, and the nomads who have herded them for over nine centuries, is protected in the right way. Until then, cashmere and wool need to be collected and used in a better way while emphasizing blended yarns (with silk, cotton, and modal) and creating Patagonia sustainability-type models that can be realized and replicated. We have started using leftover yarn and yardage to make upcycled one-of-a-kind pieces to avoid waste and keep artisans from incurring additional costs. The journey continues as this sustainable approach takes time, careful attention, resources, and market support to develop and integrate best practices in an inclusive and equitable way with nomads, artisans and local businesses, and our buyers and customers.